FRANKFURT (Reuters) - Some large Greek banks may have to be shut and taken over by stronger rivals as part of a restructuring of the sector that would follow any bailout of the country, European officials have told Reuters. One official said that Greece's four big banks - National Bank of Greece (NBGr.AT), Eurobank (EURBr.AT), Piraeus (BOPr.AT) and Alpha Bank (ACBr.AT) - could be reduced to just two, a measure that would doubtless encounter fierce resistance in Athens. 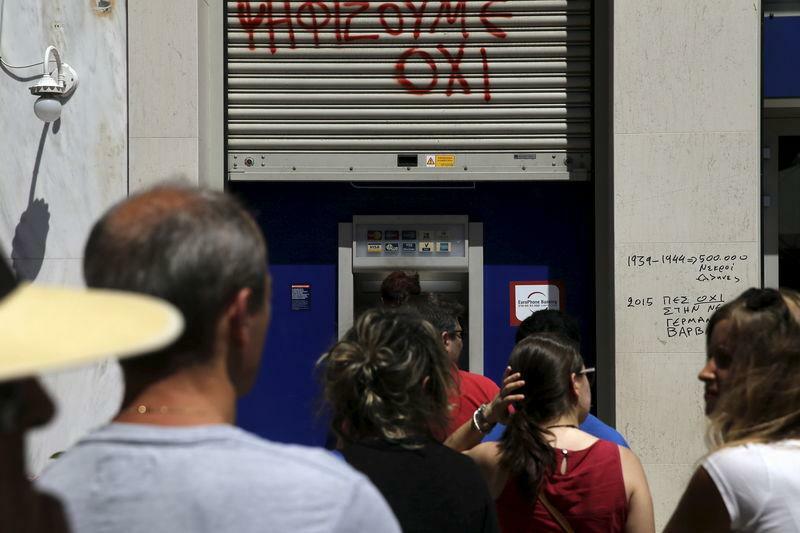 "The Greek economy is in ruins. That means the banks need a restart," said the first person, adding that prompt action was necessary following any bailout between Athens and the euro zone. "Cyprus could be a role model." "You have a tiny bit of time ... you would do restructuring straight away." Greece's financial system has been at the heart of the current crisis, hemorrhaging deposits as relations between the radical left-wing government of Prime Minister Alexis Tsipras and creditors worsened. A decision by Greek voters last week to reject bailout terms offered by the country's international creditors prompted the ECB to maintain its cap, meaning that the banks will run out of cash soon. A year ago, Greece's bankers thought they were on the cusp of a new era. They had restructured as part of the country's bailout deal, had raised fresh equity from international investors and had regained access to debt markets to fund lending. Even after the immediate liquidity problems are worked out, any restructuring of the sector would first require a prompt recapitalization of Greece's strongest lenders because rising bad debts and exposure to Greek government bonds mean they are in danger of becoming insolvent. A timeline and exact plan for the sector's revamp could be finalised after a recapitalization. Such action would face stiff political resistance in Athens, where Tsipras has pledged to 'restore our banking system's functioning'. Bank mergers save money but cost jobs, making them unpopular. Reflecting such obstacles, a second person said: "There would be an interest in having less banks ... but I'm wondering whether this would make sense in the short term." Any closures, which would be managed primarily by Greek authorities under the watch of the European Central Bank's supervisors, would not typically affect customers as their deposits and accounts would migrate to the bank's new owner. Greece's finance ministry was not immediately available for comment, while a spokeswoman for the ECB said: "The ECB Banking Supervision is closely monitoring the situation of Greek banks and is in constant contact with the Bank of Greece." Any such revamp would be a stark reminder of the withered state of the country's financial system, where deposits had shriveled to their lowest level in more than a decade before savers were forced to ration cash withdrawals. Of Greece's four big banks, National Bank of Greece, Eurobank and Piraeus fell short in an ECB health check last year, when their restructuring plans were not taken into account. A restructuring could follow a similar pattern to Cyprus, where one of the island's two main banks was closed as part of its stringent bailout, and Ireland, where three lenders were either shut or merged with rivals. But a senior Greek banker, while acknowledging that the ECB could embark on fresh stress tests and "set the recapitalization, restructuring process going again", said any mergers would reduce competition. "If the argument is cost efficiency and whether Greece is overbanked, with four players there is a semblance of competition," he said. "With fewer players, competition will be reduced even more."